You know that moment that you fall in Love? When you can’t wait to see that person again? I think I am in love with my Instant Pot. Every day I am finding new dishes to make in my pot and I can’t wait to try to use it again, sounds like love to me. Today I was super busy and before I knew it it was 8 pm and I did not even start dinner. I use to go grab takeout. Now I just run into my kitchen and see what I can throw in the Instant Pot and see what comes out. Tonight I made a to die for Instant Pot Cheddar & Broccoli Pasta. The perfect way to hide veggies right in with pasta. 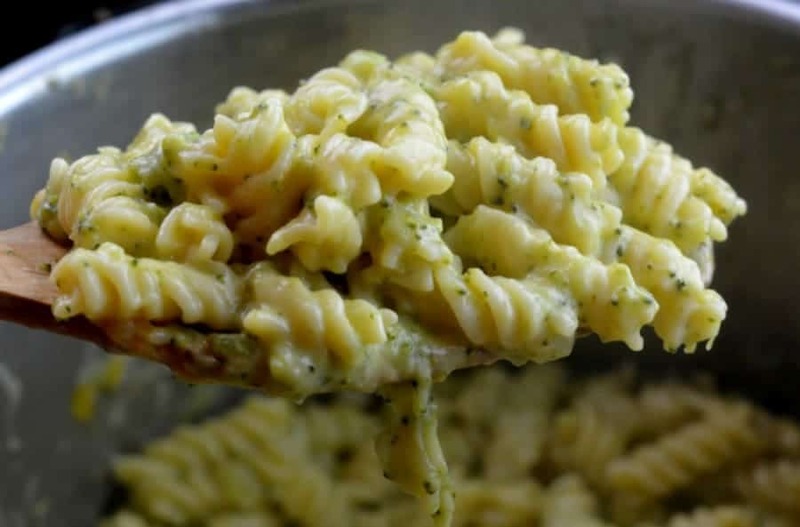 Cheesy and creamy this will be your families new favorite meal. This is a great Quick Instant Pot Meal You can even add in some frozen chicken or ham and make it a complete meal. You can also have this as an instant Pot side dish along with Sous Vide Chicken Breast. You can have your entire meal on your table in under 15 minutes. I make a big batch of Chicken breast in my sous vide every week so I have it to add to any meal. Place 4 cups water and pasta in your Instant pot. Place 1 cup of frozen broccoli in a steamer on top of pasta. Place your pot on manual HIGH Pressure for 4 minutes. Do a quick release. Place your pot on saute. Add in milk and cheese. Stir until cheese is melted. Stir in chicken If desired. Serve and enjoy. It can’t get much easier than this. I hope you like this recipe. Also please see my Better than Take out Beef & Broccoli Recipe. 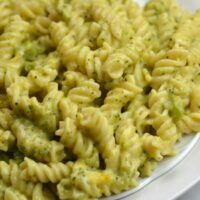 Broccoli and Cheddar Pasta Perfect side dish for any meal. Place 4 cups water and pasta in your Instant pot. 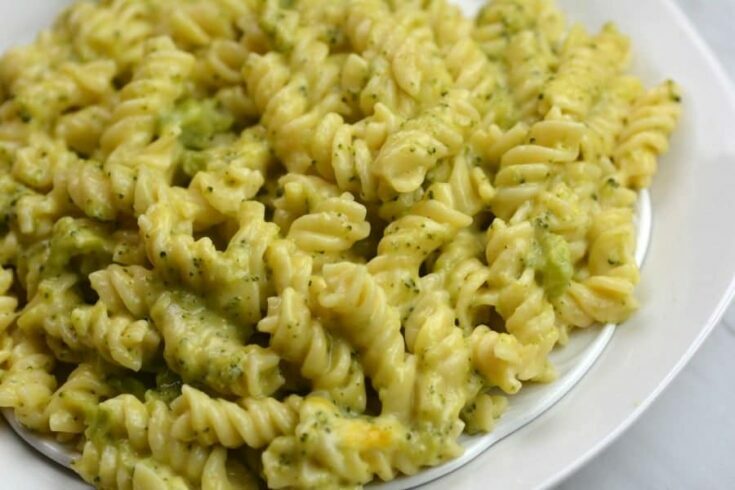 Place 1 cup of frozen broccoli in a steamer on top of pasta. Place your pot on manual HIGH Pressure for 4 minutes. Add in milk and cheese. Stir in chicken If desired. Serve and enjoy. Can I use a 6 qt pressure cooker with this recipe? What about fresh broccoli? Could I use that instead of frozen? Another excellent quick dinner that everyone agreed will need to be repeated! We improvised a bit and added some cooked ground chicken, and used fresh broccoli. Our only suggestion is to add a pinch of salt and pepper. Im not a healthy person, but I would add more broccoli and less cheese 😉 thumbs up on fast and easy though! I got a block of cheese and some chicken to throw in.. but I don’t have a steamer yet for my instant pot so can I steam them in the microwave then add with the chicken and cheese? There was still water left in the bottom of the pot after I quick released it at the end to add the milk and cheese — needless to say, it was very water after stirring. Is this normal? What is the point of placing the Insta pot on saute….? Do we leave it on that setting for however long we think….because it does nothing when you need to take the lid off to stir in the milk and cheese…? The sauté function heats up the milk and helps melt the cheese. The sauté function is always used without the lid. I’m guessing she says to use saute to heat up the sauce and cook it down a little. When you do saute you leave the cover off, or I do anyway. That way you can keep stirring so it doesn’t burn the cheese/milk. So yummy! I followed the recipe amounts except I only used 12oz of cheese and did Gouda. I added salt, pepper and red pepper flakes. The sauce was perfect, not watery. I microwaved the frozen broccoli because I was afraid it would be too mushy at 4 minutes based on previous experience. So easy and I’ll make this again and again! Very quick and easy! Needs seasonings though. Thanks! Needs salt, but otherwise a great recipe! I wasn’t expecting this to be so tasty. I first cooked boneless, skinless chicken thighs in a cup of water with a tsp of better than broth, chicken flavored, for 12 minutes. Then I took out the chicken and measured the leftover water. I used 1 pound of spaghetti, broken in half so they fit and added water to the liquid to equal 4 cups. Then I added 2-3 cups of fresh broccoli on top. I cooked for 4 minutes as recommended. I shredded the chicken while the pasta cooked and added it to the pot once the pasta/broccoli was finished. Added the cheese and half and half afterwards. Besides adding a healthy dose of salt and pepper and a few shakes of garlic powder, it really didn’t need a lot of seasoning. Delicious! Can you add fresh brocoli. And if so how long will it take? Can you add raw chicken to the recipe? If so, does the cooking time change?